AT&T’s game of catch-up in the Long Term Evolution (LTE) networking game took a big leap forward today with the announcement of two LTE-capable smartphones for AT&T, Android-powered offerings from HTC and Samsung. AT&T also announced the addition of the next markets to get LTE service, a list that includes Boston, Washington D.C., Baltimore and Athens, Ga. Though the LTE advancements are welcome for a nation looking for more high-speed networking what may be more significant to AT&T customers is a claim that the company says it has now completed the software and backhaul improvements to support its HSPA+ flavor of 4G over two-thirds of its coverage area, meaning that AT&T no longer has to call out its 4G markets like it did earlier this summer. 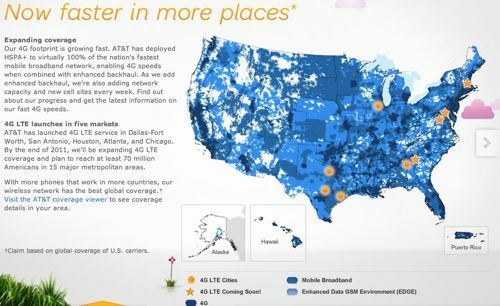 When you now go to the AT&T 4G coverage map the only “new” markets highlighted are the ones with LTE or about to get LTE; there is no longer any pop-up distinction for the 4G HSPA+ coverage, like the map had earlier this year. Though AT&T still won’t publish a list of HSPA+-enabled markets — we are still asking company spokespeople to point us to one, if one exists — our guess is now that the LTE launch is finally underway AT&T doesn’t have to play its we’ll-call-anything-4G game anymore. We’d still like to see a coverage map with more honesty, however, with actual tower locations and expected coverage speeds. But we’re not holding our breath.